Last week, I attended a USA Weightlifting coaching clinic. I learned proper techniques for weightlifting movements such as squats, deadlifts, cleans, jerks, and snatches. I also learned a lot about effective coaching in the sport of weightlifting. But, most of all, I learned that I still have a lot to learn about this sport–both as a coach and as an athlete. Why weightlifting? When I was a freshman at UCLA, I was a walk-on with the women’s varsity swim team. These ladies are not kidding around! They train 20+ hours every week–not just in swimming, but also in yoga, weightlifting, running, and other “dryland” workouts. That was where I was first introduced to the barbell, and I loved it! But, I decided not to continue swimming after my first season, and so my weightlifting career was on pause. A couple of years later, this time as a triathlete, I came back to my old friend Mr. Barbell, and was instantly reminded of the extreme soreness that he inflicts after long absences. We hung out a few times, and I felt extra strong again, but then I graduated from college and bid farewell to my friend once again. This fall, I started to miss those good old times, and decided to buy a used barbell on Craigslist. I figured that if I wanted to start lifting again, I’d better learn to do it correctly. Plus, I enjoy broadening my general knowledge for my personal coaching and training. Who is weightlifting for? I am so glad that you asked! 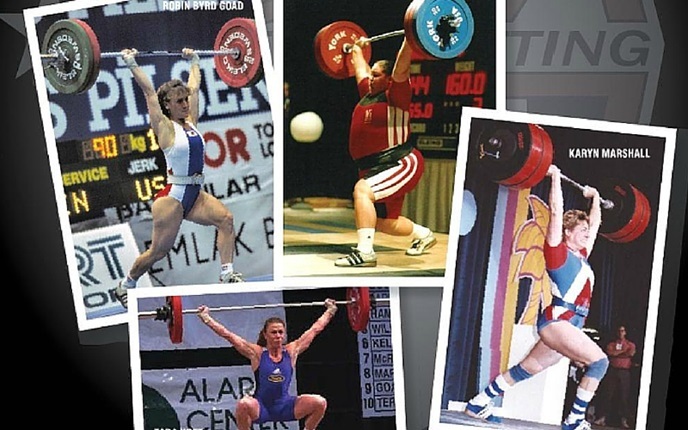 Weightlifting is not just for bodybuilders and CrossFitters. You don’t have to enter weightlifting competitions or go on the Paleo diet to enjoy the benefits of weightlifting. It is actually an excellent strength, power activity for everyone–triathletes, runners, swimmers, cyclists, numerous other athletes, and those seeking general fitness. You can add weightlifting into your training schedule and expect to see improved performance because it utilizes muscle groups and movements that are key components of pretty much every other sport. Another carry-over of weightlifting into other sports is improved technique and injury prevention via strengthening weak or under-used muscles and improvement of balance, stability and coordination. But, isn’t weightlifting dangerous? It can be dangerous if done incorrectly. Please don’t just show up at your gym, pick up a barbell, and start lifting because you once saw a weightlifting competition on TV. Ideally, you should learn proper technique and skills from a certified weightlifting coach. A qualified coach can assess your readiness to lift and take you through each movement step-by-step at an appropriate pace. In one of my favorite parts of the coaching course, our instructor showed us a scientific research-based table documenting sport-related injury rates. Interestingly, weightlifting carried lower injury risk than other sports within the study (Hamill 1994). What is the difference between Weightlifting and CrossFit? Great question! While I do not mingle with many weightlifters or CrossFitters, I believe that both sports have their unique benefits and drawbacks in terms of fitness goals, environment, etc. Whether you choose to lift weights, do CrossFit, join a bootcamp class, run, bike, swim, or take up yoga, I hope that you find an activity where you can challenge yourself, have fun, stay fit, and be safe! When you head into the Transition Area at your next triathlon, watch out for this lady–just in case she happens to also be there (and even if she isn’t, because you just never know). Katie could probably quit everything and become an overnight success story in professional transitioning if she wanted. She rehearses transitions during her study breaks, and has won multiple awards for her speedy metamorphoses between disciplines. She once changed superhero costumes and savored a cup of coffee in T2 and came out 24 seconds before her nearest competitor could tie her shoes. That’s pretty much what happened. 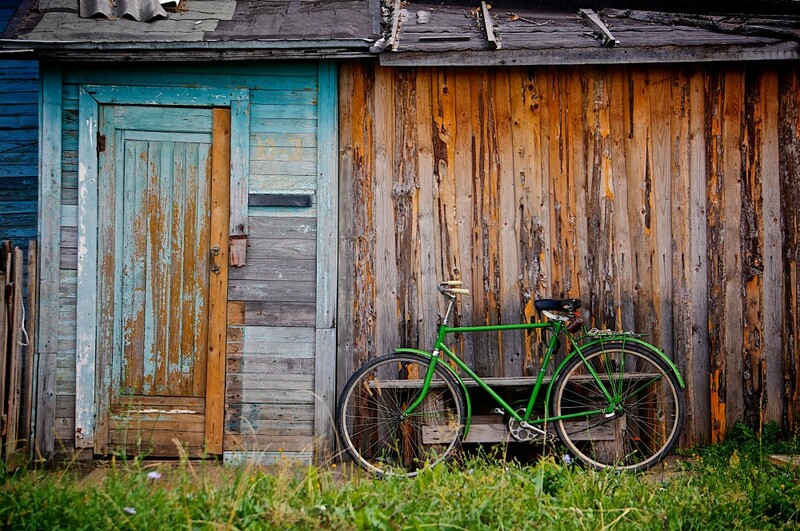 When/how/why did you start triathlon/endurance sports? I became obsessed with swimming after watching a swim meet, and I’ve always been running; it seemed like a logical step once I realized my hand-eye coordination is not good. If you had to remove one leg of the triathlon and swap in a new sport, what would you subtract, and what would you add, and why? I would’t change it even if I had to. Thats how much I absolutely love this sport. This edition of Meet the Athlete features French triathlete Guillaume Germain. When he’s not training, Guillaume enjoys bulking up his triceps and writing his phone number on them with a Sharpie. Ladies, if you see him out on the beach, jot down his digits and give him a call! Race mantra: The faster I go, the quicker I get to that cold beer! 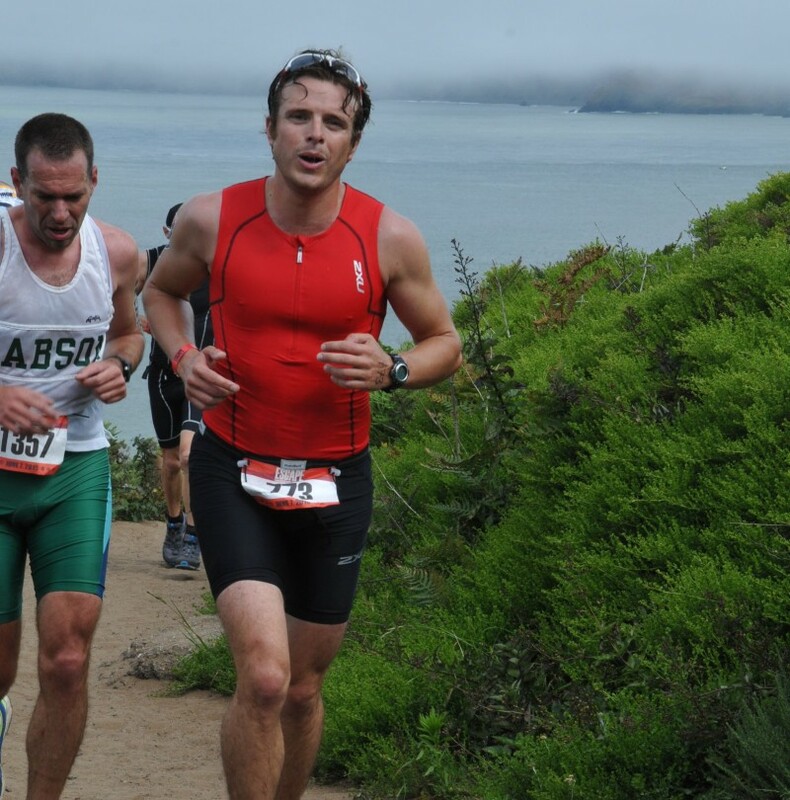 Most memorable race moment(s): Escape from Alcatraz- halfway through the swim realizing I was in the middle of the San Francisco bay. Wildflower triathlon- training partners and other racers supporting each other, and having friends waiting for us at the finish line. It makes a big difference to have friendly faces at the finish line to share your joy with. Words of wisdom to someone considering training for their first triathlon/endurance event: Follow a plan, train regularly and don’t start too hard at the beginning. 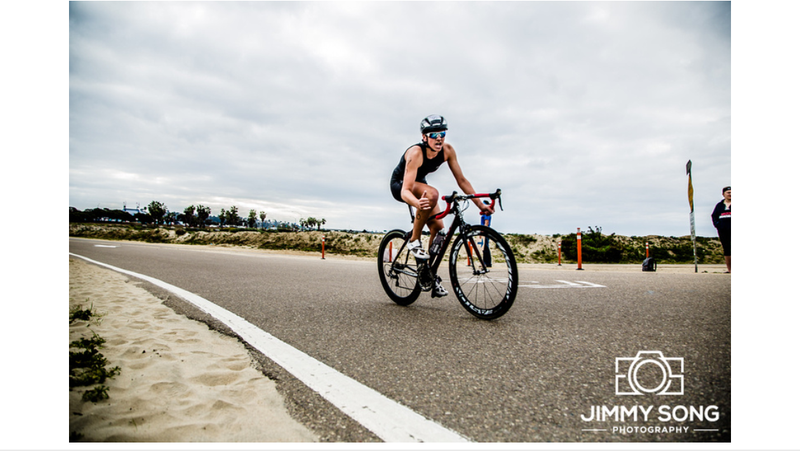 Something you’ve learned about yourself through triathlon/endurance sport: With the right training, you start building your confidence to tackle the race on the right foot, and be able to achieve or out-perform your goals. Race tips: Check the transition area the day before and get your bearings as it can be pretty overwhelming after the swim. And ride/run the course prior to the race if possible. Training/racing pet peeve(s): Pet what? Why do you keep Tri-ing? Because of this feeling of accomplishment once you cross the finish line! What does “Fuel” mean to you? Food that’s good for you (recovery, protein, etc) but that also tastes good. What does being “Fit” mean to you? Loosing another 5-10bs! Want to see yourself featured in a future edition of M.T.A.? All BrittFit Athletes are eligible. You could be next!